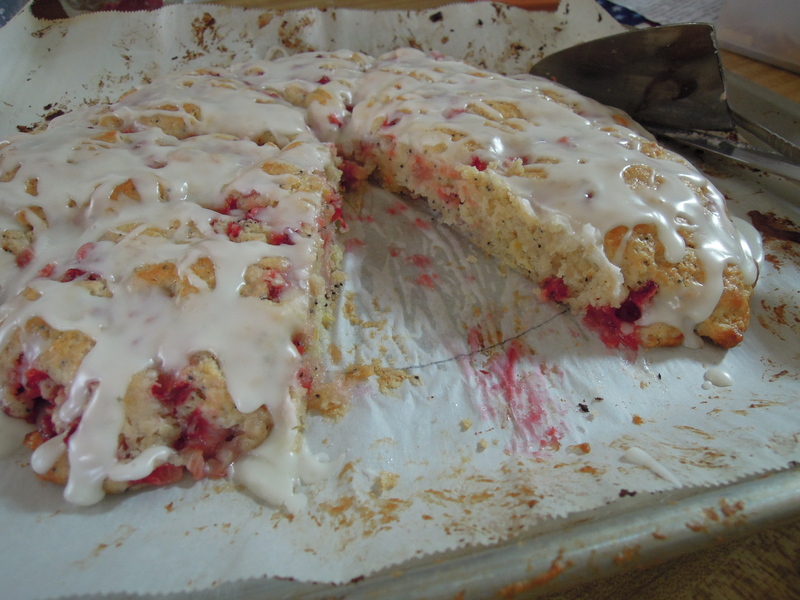 These scones are OMG delicious! 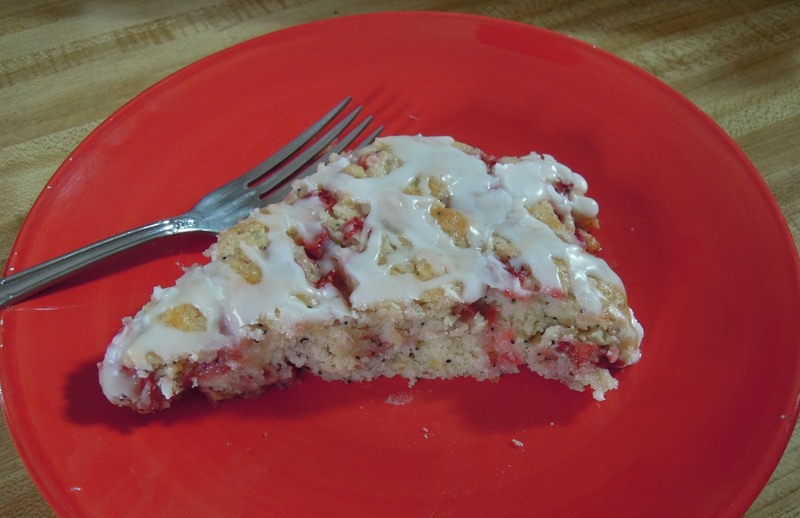 The lemon-strawberry-poppy seed combo is A-M-A-Z-I-N-G! 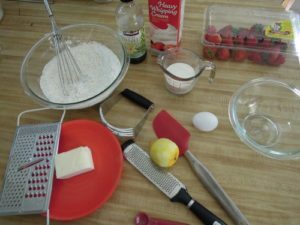 I have recently spent a lot of time at Sally’s Baking Addiction, and I came across her recipes for scones. 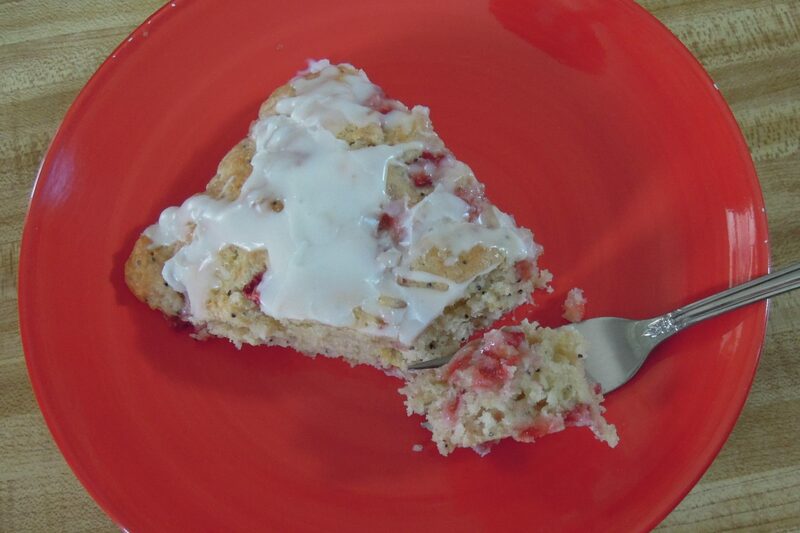 Her previous experience with scones was similar to mine, but she claimed this recipe was wonderful, so I took a leap of faith and decided to try the recipe. I was not disappointed, and I don’t think you will be either. She has several other flavors that I am excited to try. 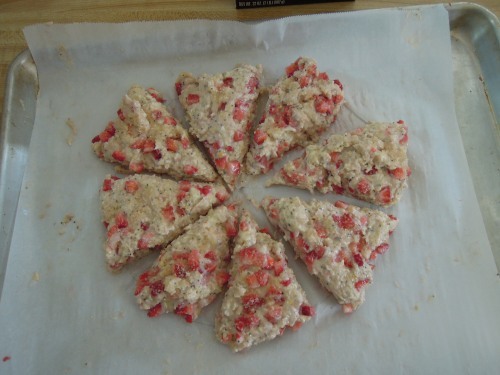 I already have some blueberries on standby in the refrigerator to try the blueberry scones. 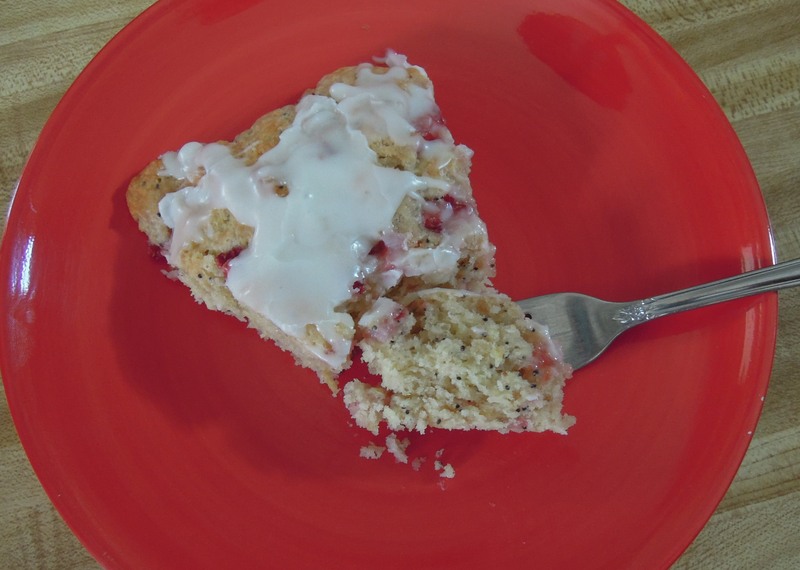 These scones are soft and moist and absolutely overflowing with delicious flavors. They remind me of a combination of a muffin and a biscuit. I read an article about scones that very adamantly insisted that scones are not biscuits, so I am apparently committing blasphemy to even link the two, but whatever they are, THESE are not dry or tasteless or hard. I concur with Sally that they are wonderful! 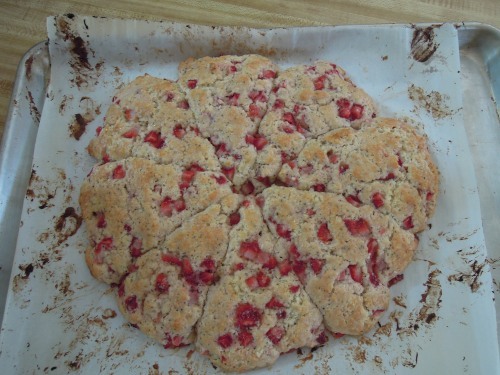 *Follow the link to Sally’s Baking Addiction for the recipe and her gorgeous photography, or I have rewritten it below. 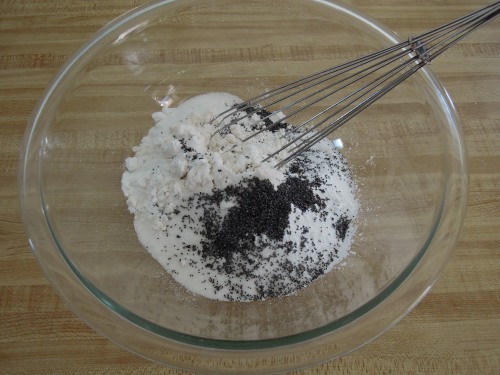 In a medium mixing bowl, whisk the flour, sugar, baking powder, salt, and poppy seeds together. Add the lemon zest and whisk again. 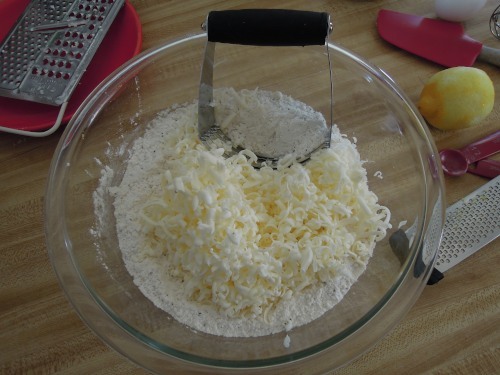 Grate the frozen butter with a box grater or cheese grater and toss with the flour mixture until covered and distributed. 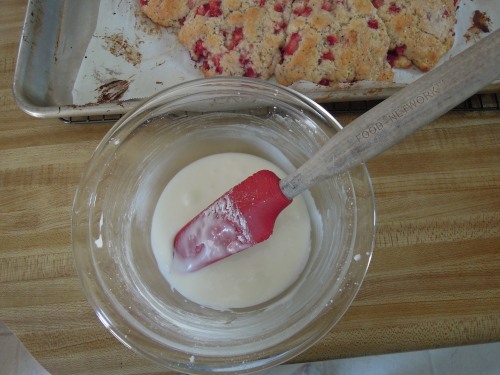 Use a pastry cutter, fork, or your fingers to cut the butter and flour mixture together until you have coarse crumbs. 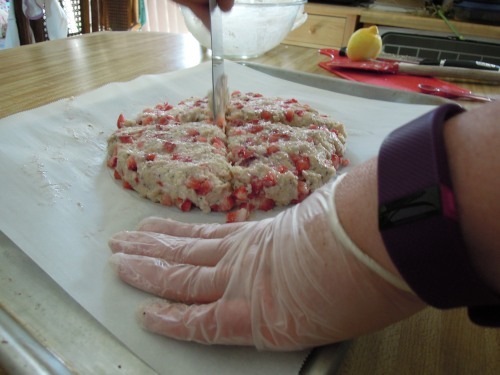 (Tip: The purpose of the frozen butter is similar to when making pie or tart crust. 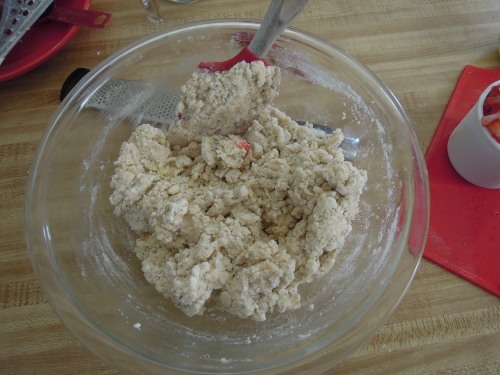 The chunks of butter give more flakes and better texture. 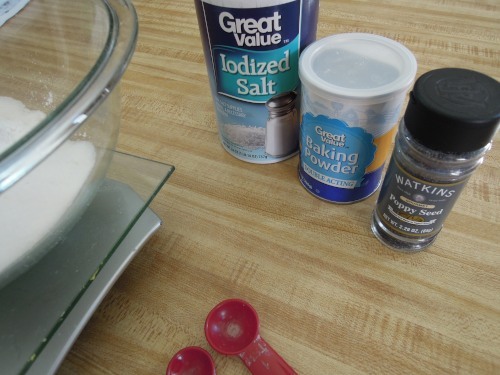 Reviewers for other recipes I looked at complained about this step and some even added melted butter instead. 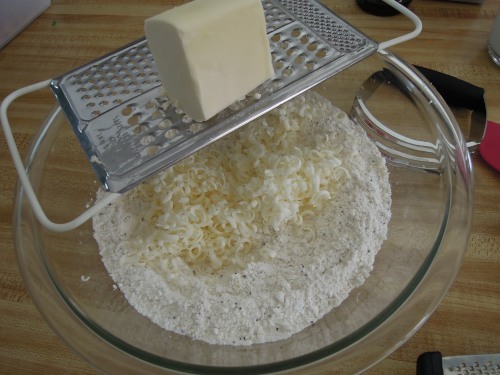 It honestly took me only 2-3 minutes to grate and seems necessary to me.) Set aside. 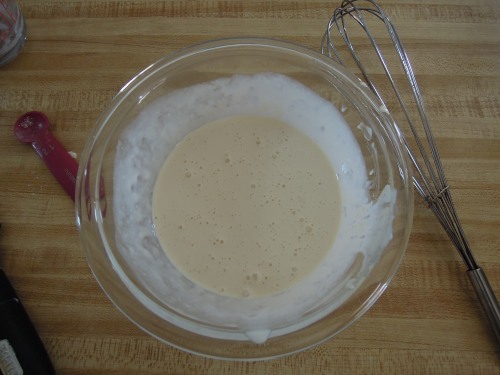 In a small bowl, whisk the cream, egg, and vanilla together. Drizzle this mixture over the flour and butter mixture and then toss the mixture with a rubber spatula until everything (or almost everything) appears moist. 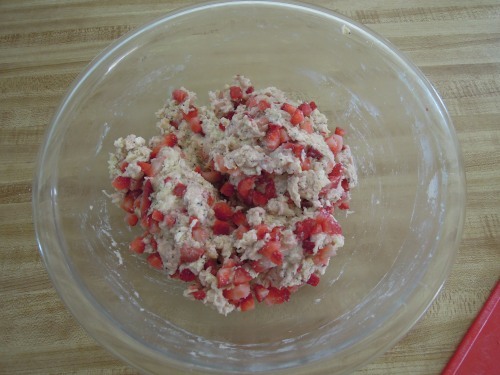 (Don’t worry if there are still a few crumbly bits–they will get moist when the strawberries are added.) 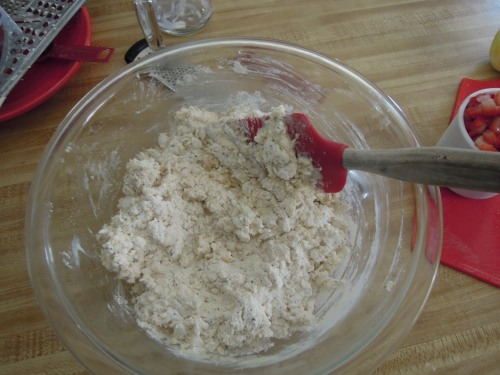 Be gentle and avoid working the dough too much. 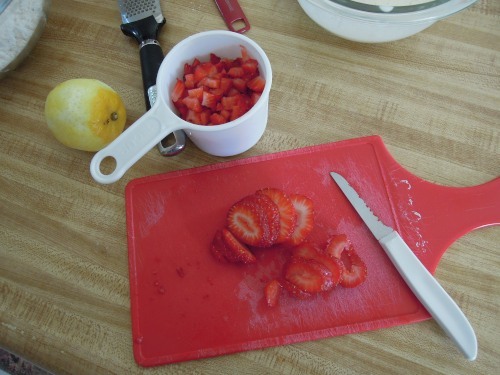 Gently and slowly fold in the chopped strawberries. Dough will be very wet. Don’t worry about this step. 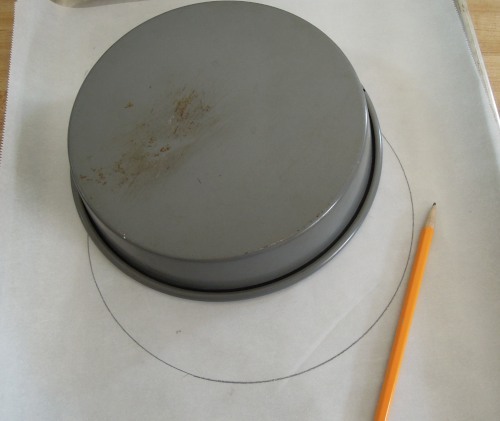 This is not separated enough anyway. 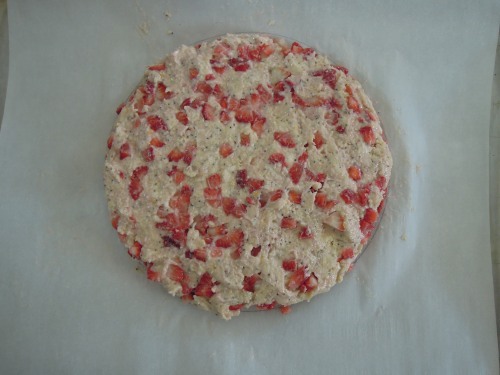 Top dough with sprinkles of coarse sugar if desired and then bake for 20-25 minutes or until lightly golden and cooked through. 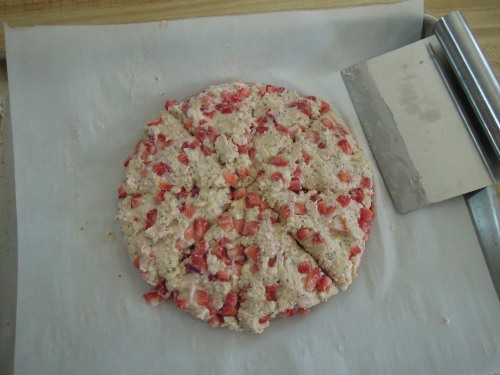 Remove from oven and allow to cool for a few minutes. 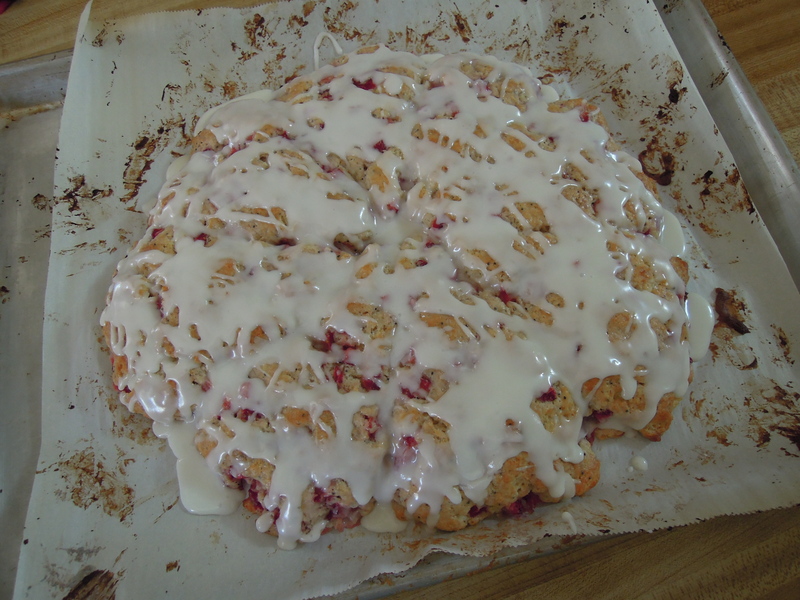 While the scones are baking or cooling, whisk together the glaze ingredients. 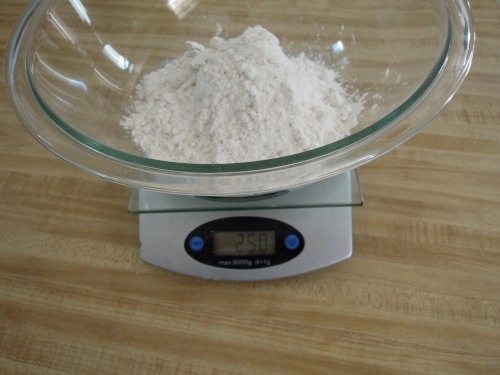 I measure 1 cup of powdered sugar and 1 tablespoon of cream and then begin whisking. I add lemon juice (1-2 tablespoons) until I am happy with the consistency. Drizzle over the warm scones. Scones are best when still warm and fresh from the oven.